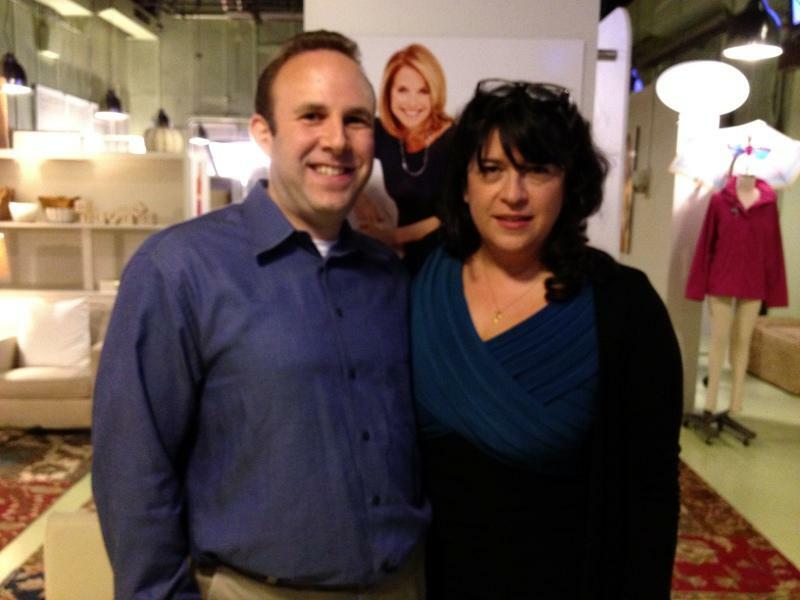 Today was my appearance on Katie with special guest, Fifty Shades of Grey author E L James. (If you missed the excitement, do some catching up on Why I’m On Katie Couric’s new show). I had no idea what to expect and was somewhat nervous this morning. I was actually surprised I wasn’t MORE nervous all weekend, but it didn’t really hit me until this morning as I was getting dressed. Katie’s team sent over a car service to pick up my wife and I at 9 a.m. and bring us to the ABC studio down in New York City. Since schools were closed in our area for the Jewish New Year (Happy Rosh Hashannah, everyone! ), there was absolutely no traffic and we got to the studio before 10, roughly 30 minutes early. We took all of maybe three steps into the building before we were greeted by the super smiley Lisa Cohen who welcomed us to the show and brought us right into the green room. I have no idea if she was literally waiting there in the lobby for us all morning, or just happened to see us on a monitor or something and ran down to meet us. 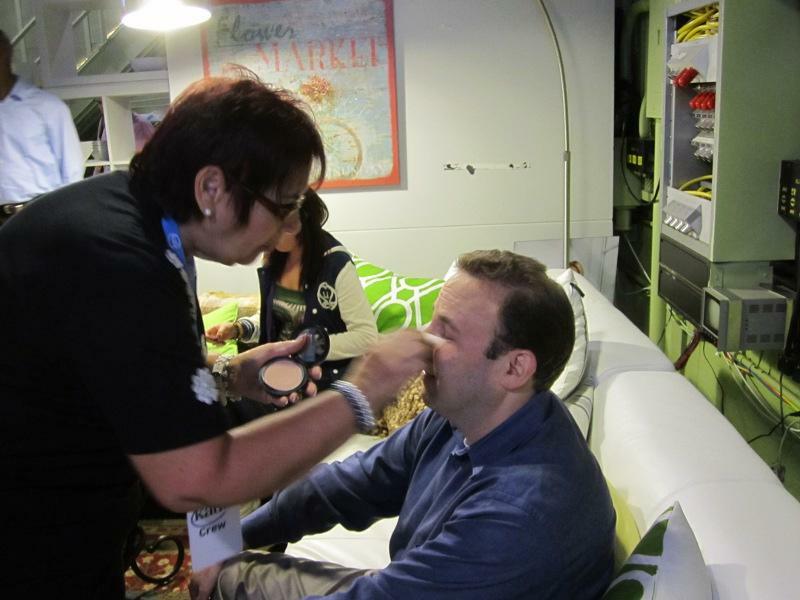 My first impression of the green room was that, yes, it actually was green! In my head, I pictured a green room as a small room with a couch, some food and a big TV. This was more of a huge loft, broken up into various sections. Tons of homey decorations adorned the walls, along with oodles of photos of Katie Couric. There were also a bunch of couches, tables, TVs, and a whole monitor section showing all the various camera angles from the set. Allie waits in the (yes it really is) green room on one of the zillions of comfy couches. There’s no confusion as to whose Green Room this is. Katie’s photos are plastered everywhere. Loved watching the show from these monitors, covering the stage and all angles of the audience. Katie put out a nice spread of bagels, fruit, cheese, crudite, and of course, much-needed coffee. 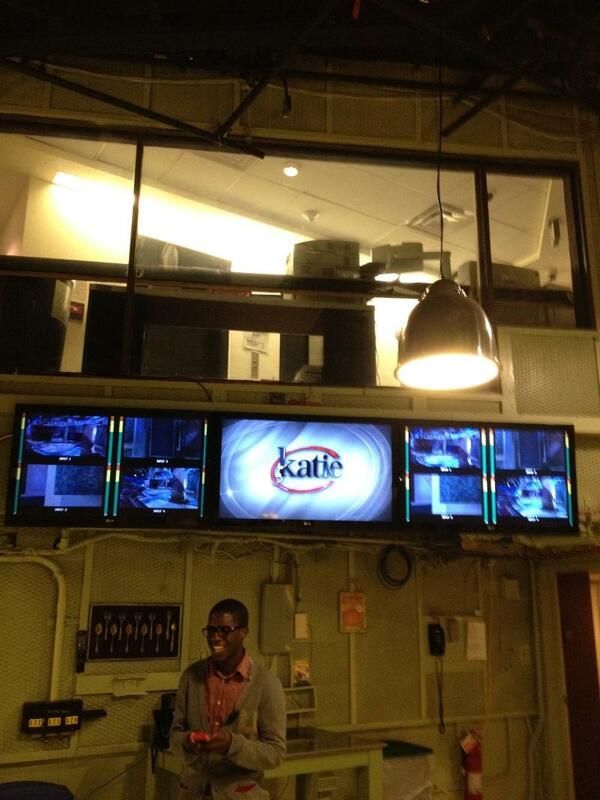 While waiting in the Green Room, I spent time with some of Katie’s producers, assistant producers, show runners, etc. Lisa spent some time with me running over a number of questions Katie would most likely ask. This definitely helped put me at ease a bit. I also met Jamar, one of the two other guys I’d be sharing the stage with, and we all ran through a dry run together on it. Soon after, the third leg in our “Guy’s Perspective” tripod arrived, NY radio sports guy Craig Carton. 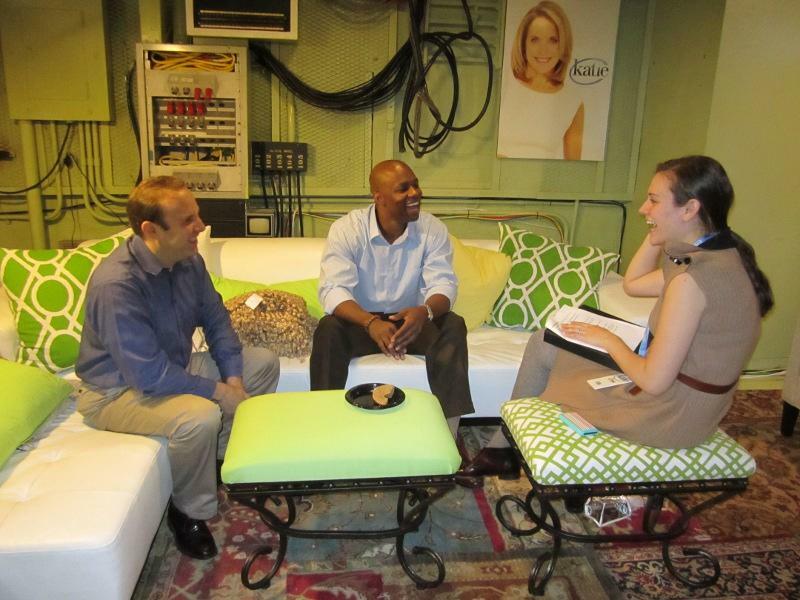 Jamar and I do a dry-run of the questions with Lisa. Allie and I tried posing somewhere that didn’t have a giant photo of Katie Couric on the wall, but alas, we couldn’t find a single spot. Yep, I’m definitely on the list! There was definitely a lot of waiting around in the Green Room, especially since the show didn’t start actually taping until noon. As the hour started approaching, the makeup and hair duo (two very nice women, whose names I unfortunately forgot) took care of my frizzy hair and even slapped some powder on my face to cut down on the shine. My wife LOVED what the hair stylist did to my hair and talked with her about it. Apparently she used something called Magic Move, which is a bit pricey for a small jar, but you use very little, so it should last. With my mega frizzy hair, it’s probably worth it. Eventually they mic-ed us up, including Allie, who got to sit front row in the audience. Neither of us thought she’d actually have to say anything, but now we were second-guessing that one, wondering what Katie’d be asking my wife! Turns out, they never did. Guess it’s better to be safe than sorry. We headed backstage and did a mic check and then quickly met Katie herself. We just got to say a super quick hello and shake her hand but Katie’s as stunning and personable in person as she appears on TV. She’s just warm, friendly, and super sweet. Plus she totally rocked the leather dress she had on for today’s racy show. Allie snapped this stage photo while I was still in the Green Room. Notice the blue lights. They switched to red, in honor of Fifty Shades of Grey, when the show started taping. Katie, E L James, and one killer leather dress. We headed out to the stage where Katie introduced us to the crowd, as well as E L James herself, who was sitting right next to me the whole time. 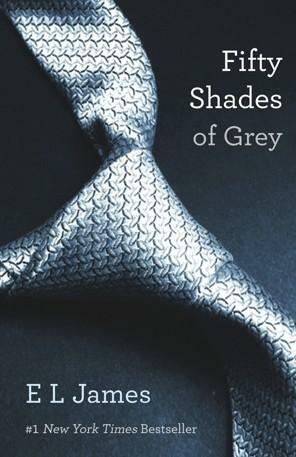 While I’m not the biggest fan of the Fifty Shades of Grey book (I am a fan of my wife reading it, though, just not me reading it), it was great meeting the author. Erica (That’s what the E stands for) was actually very down to Earth, witty, and a real pleasure to meet. She’s British too, so you just have to love that accent. The segment went great and once it got going, it pretty much turned into a conversation between the three guys and Katie. It’s really what Katie Couric does so well and deserves high marks for: interviewing. She has such a knack for turning an interview into a very comfortable, informal conversation. Her smile and sincere interest in your answers just instantly puts you at ease. My only complaint was that our segment seemed to be over before it even began! I wish we had loads more time, because she only got through a few of the questions we had prepared for earlier in the Green Room. 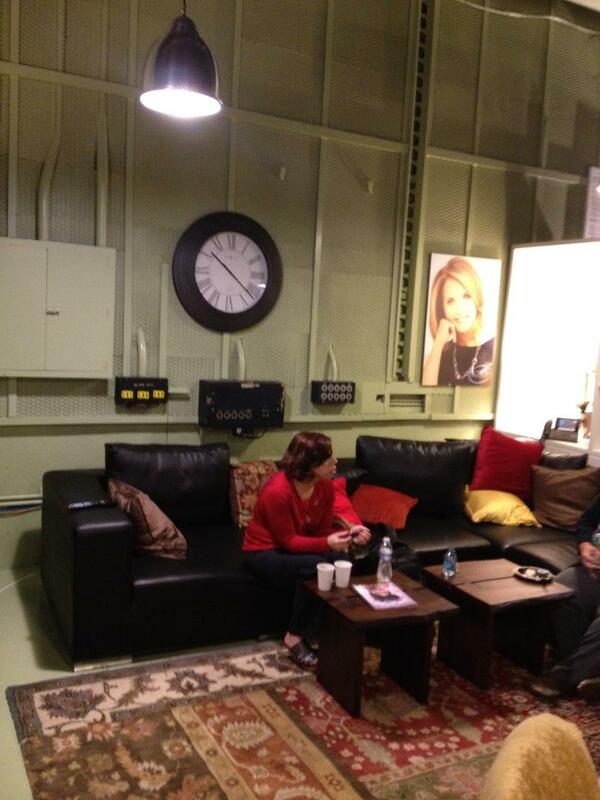 After the show, I was back in the Green Room waiting for Allie and the rest of the audience to be finished. They actually kept the audience on for an extra 10 or 15 minutes to do some other recordings after EL James had finished her segment. So while I was waiting, I saw Erica come back, do a few more short videos with the social media crew, and then she just hung out chatting with some of her friends, while she munched on some veggies. I took that opportunity to briefly chat with her and she was kind enough to sign a book and take a photo with me. I tell you, I still may not be a fan of the book itself, but she’s definitely won me over as just a really nice person. Every audience member received a copy of Fifty Shades of Grey, and Erica actually stayed to sign every single copy. 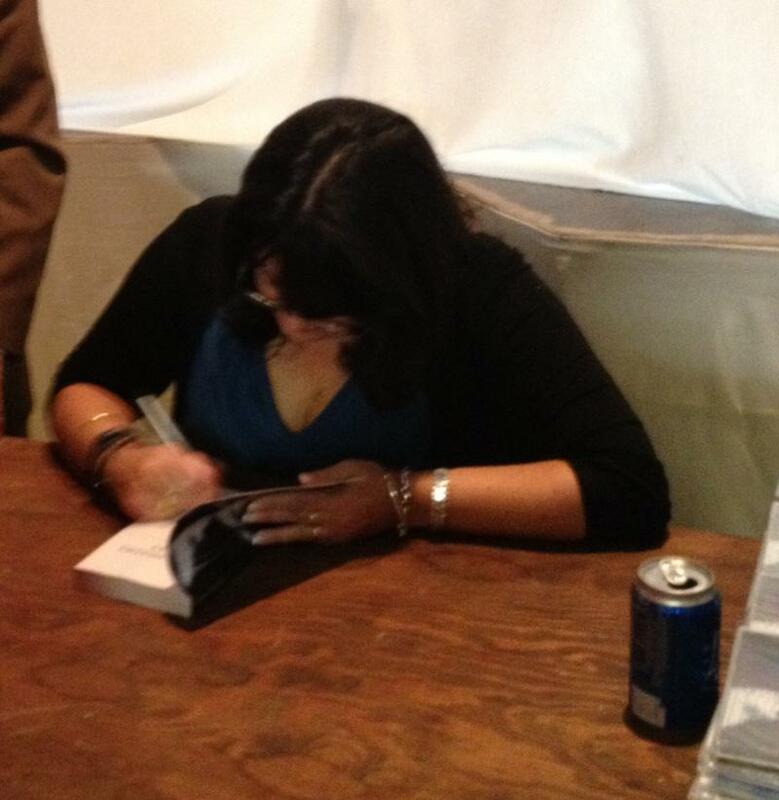 E L James signing Katie Couric’s “Signature Board” in the green room. Erica graciously signed books for everyone in the audience. All in all, I had a real blast today and loved seeing all the behind-the-scenes things that go on during a television taping. I have to commend Katie Couric not just on an awesome show, but also on having one incredible staff. Everyone was not only super duper helpful and accommodating, but they all had these ginormous smiles on their face the entire time. Thanks so much to Katie, Erica, Lisa, Lindsay, Sara and everyone else who helped make today such an incredible experience. 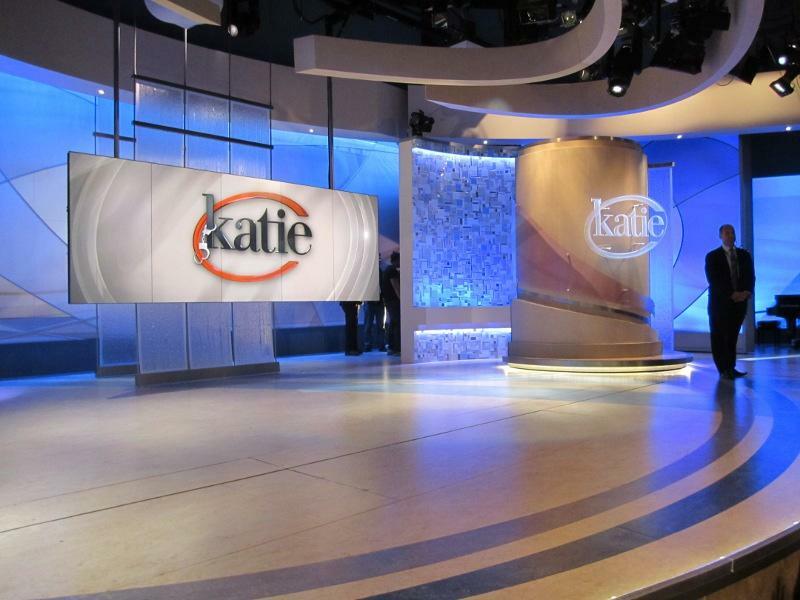 I’d love to make it back onto Katie at some point in the near future. Though the next time, hopefully I’ll be on to promote my own best-selling book. Check out KatieCouric.com for more behind-the-scenes tidbits from today’s show. The Anatomy of an App or Well That Explains How the Human Body Works! That is seriously awesome!!! Your wife looks so pretty! Did you notice anything different on your site as a result of being on the show? Hey, Penelope. Thanks for the compliments! Haven’t really noticed any uptick or anything yet from my appearance, probably because I didn’t get to plug it at all on the show. If only they had shown my name with a MommysBusy.com listed right after! Awesome post showing us what it’s like behind the scenes! You’re so #BOSS! Funny thing — my Dragonslayer has read all 3 Fifty Shades books and I haven’t read a one (yet). I’m still on book 5 of Game of Thrones. Can’t start 50 until I finish GoT. Martin is working on book 6 for GoT, but I think I’m safe in assuming he’ll still be writing by the time I finish the 3rd 50 book. My hubs loved the books. Very cool – you looked very ready for your close up. Nice job on the show. Hey, thanks, Shawn. And thanks for sharing it on your podcast! Very impressive! I wish you had a longer segment because I was thoroughly entertained. I look forward to your best seller! Thanks, Ilana. I wish I had a much longer segment too! I told the producers I’m available any time if Katie needs a sidekick. I can’t stop laughing that she signed Laters Baby!! Rachel recently posted..Great New Gluten Free Snack Option Available in Phoenix! Awesome! The video is available for whatever reason so I’ll have to see your big debut later. But, congrats! again!!! Hey, Monique! Thanks. The video’s working fine for me. What browser are you viewing this in?